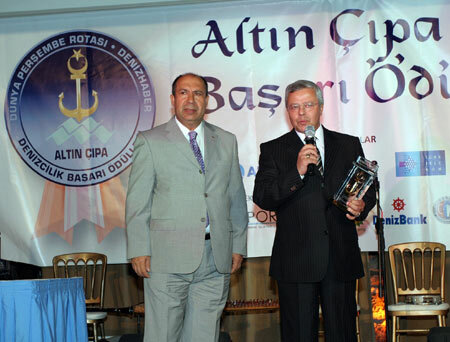 Alt?n Ç?pa (Golden Anchor) Shipping Awards were met with its owners with a great ceremony which is organisated by Dünya Newspaper's Per?embe Rotas? Extra and Deniz News Agency and the meeting point of the shipping sector. To this important night which was done at Sait Halim Pasha Mansion with a great participation of business world, the administrators of international institutes such as: IMO, ITOPF, INTERTANKO, IOPC, IACS. 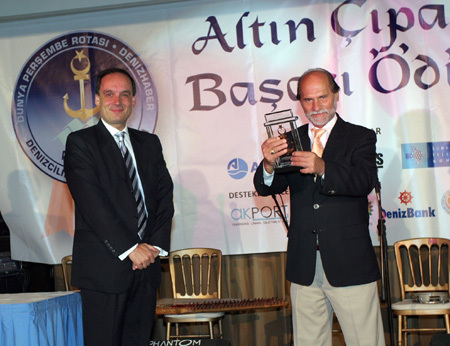 Golden Anchor Shipping Awards which are given to honor the achievements of Turkish Shipping were given this year at 8 branches. Besides 2 special awards were given too. 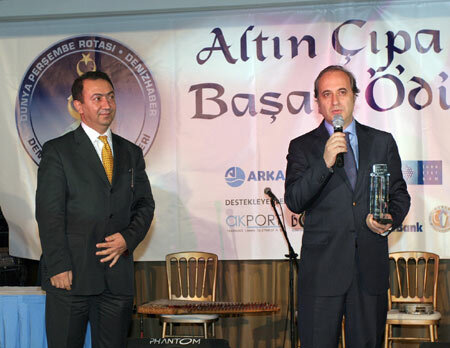 DÜNYA Companies Group Vice Chairman of the Board of Directors Erdem Top who said: " Dünya Newspaper which watches the shipping sector with a great attention, wants to award the successful ones to cheer more." 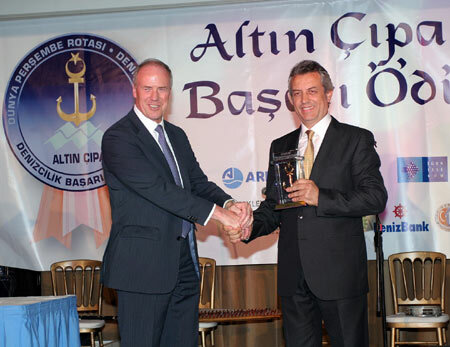 continued: "Our most important aim is to provide the increasing of Turkish Shipping Awards-Golden Anchor. We, as Dünya Newspaper Per?embe Rotas?, by housting sails, as we have been with Turkish shipping until now, will be with it tomorrow too." On the other hand Deniz News Agency Editor Chief Recep Canpolat said that they were so happy that international establishments cared about the ceremony. Erdem Top who talked at the opening of the ceremony said "To show our belief to the shipping sector we started publishing Per?embe Rotas?. Top who said "We have been watching the problems of shipping sector very well for 27 years." 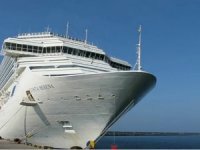 continued saying " Today our country's fame at shipping technologies, trade, sea tourism, ship-vessel building increasing amazingly. We believe with an enormous faith to the fact that Turkish Shipping will come to the very good places in next future." Target at 2008 is "white list"
Erdem Top said: ?Shipbuilding Industry that powers the shipping sector, has got over the crisis days behind. Today shipbuilding industry is an establishment that make Turkey win 2.5 billion dollars valuta and provides employment to 30 000 people. Today there are 61 ships which are still on the construction and there are over than 500 ships which are signed. For the first time in many years Turkish Flag at its 81th shipping festival rised to grey list from the black list besides we believe that our national fleet will be in the white list next year too." 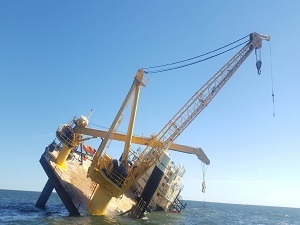 Top told Turkish Ship Owners which were known as traditionalist were that day very active at building new ships and buying second hand ships in the world. 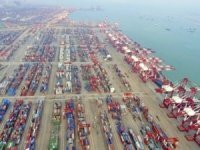 Top who says "The success at sector is also seen at the ports too." continued his speech: " At last 5 years the the cargo move in Turkish Ports advanced to 202 million tones from 125 million tones and container traffic is growing % 80 by reaching 3.8 million teu." 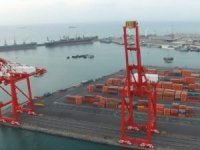 Top said "International port operators such as; Singaporean PSA and Hutchison from Hong-Kong and Dubaiports comes to Turkey for investment." 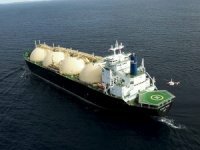 Saying " Turkish yacht and vessel producers reached and about to overtake the European producers" Top added: " Malta ?ahin vessel which is built at Turkey captivated the producer world with its record of being the second enormous vessel." and he continued " At the construction of Mega Yacht, by building 61 mega yachts Turkey got the third one in the world mega yacht building list." 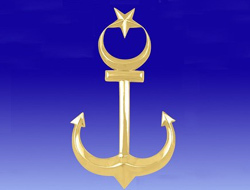 Deniz News Agency Vice Chairman of the Board of Directors who said "They were so happy that international companies joined to the organization too" continued: " As two press establishment our aim is to increase the shipping industry"s performance, the motivation of Turkish shipping's and award them for this." Canpolat said:" Last years the rushes shipping sector is palpable, especially the works of Ministry of Shipping that can be named "revolution" make the Turkey to the highest place at the shipping, now Turkish Shipping has been living its golden age." Canpolat who said ?Shipbuilding industry increased its capacity % 300 and reached 8th from being 23th." continued: ?Because of being at a very geopolitics place, our country is at the corridor of energy traffic. After the full capacity activation of Bakü-Tiflis-Ceyhan (BTC) in 2015, 50 million tones petrol will be carried in this pipeline. 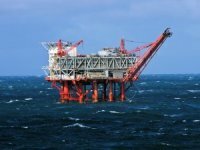 Turkey at the energy dispatching has %5 apportionment." Canpolat said: ?With the investment done the ways of benefiting from the cruiser tourism which has 25 billion dollars apportionment at Mediterranean Crock, are being opened to Turkish Investors. 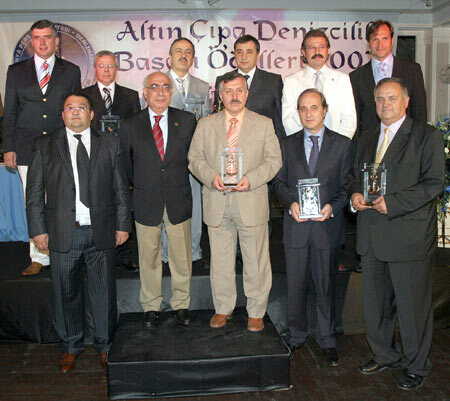 The ones won awards and the top executives are together at the end of the ceremony. Balkan& Black Sea Shipping Agency Chairman of the Board of Directors Arif Kenan Türkantos while taking his award from IMO Conference Director Monica Mbanefo said "Golden Anchor Shipping Award is so meaningful for us." 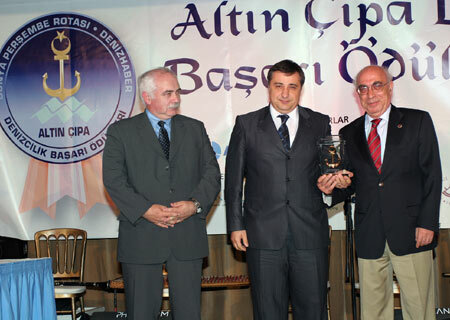 Council President of Chamber of Sea Trade Erol Yücel gave his award to Çeksan Ship Building C.O. General Coordinator Ergin Türesel said:"If we hard worker, by doing better works at Europa and at other countries we want to introduce us." Ege Ports General Director Aziz Güngör while taking his award from IMO Execution Director Jo Espinoza Ferrey, he said:"This award will motivate us very well, thank everyone worked for." 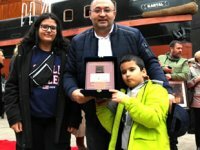 Garanti Bank's award which provide the finance of 15 ships bought by Turkish Shipowners, Garanti Bank and Trading Coordinator took their award from the general manager of Dünya Newspaper Osman Saffet Araolat. Geden Line Technical Manager Orhan Karademir, took his award which is given him for gaining a different enterprise vision to Turkish Shipping, from Suat Hayri Aka who is the vice undersecretary of Transportation Ministry. 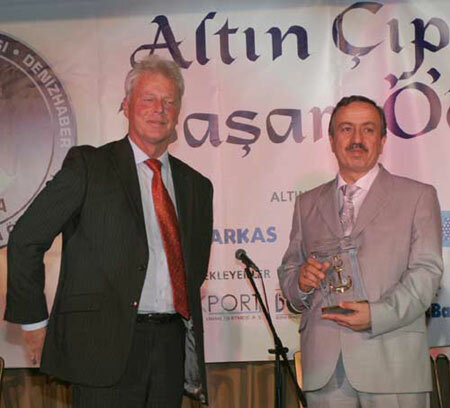 Güllük Port Chairman of the Board of Directors Mustafa Ertan Sevdi?an (right) took his award from INTERTANKO General Director Peter Swift. ?evdi?an thanked everyone and he said " By working together like a team we will achieve better than this"
With the producing of Malta ?ahini which has the record of being the longest yacht of world with 88 meters length, Y?ld?z Shipyard Member of the Board Ruhi Demirören took his award from IOPC Arrangement Committee President Jose Maura. 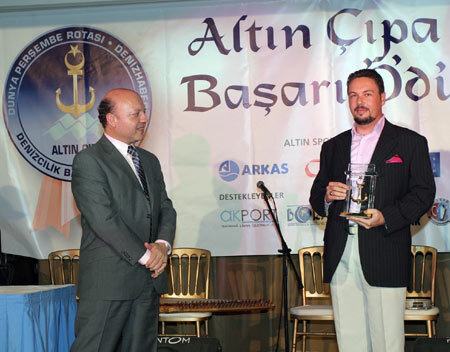 To Gürdesan Shipping Industry which take this award for increasing its apportionment in the world bazaar, award given by IMAREST Vice President and Fleet Commander of United Kingdom David Preston. 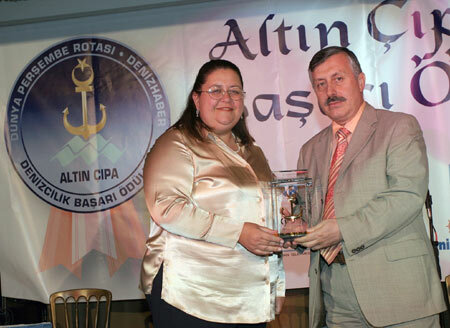 The most important person who managed to get Turkish Flagged Ships from the black list to grey list, Prime Ministry Undersecretary of Shipping Hasan Naipo?lu(right) took his award from Didem Demirkent who is the Chairwoman of Board of Directors of Dünya Companies Group.